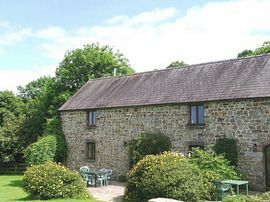 The barn has been carefully converted into a lovely cottage, many of the orginal features still remain. There are massive exterior stone steps (as well as an internal staircase), vaulted beamed ceilings and stone walls all enhancing the character of the property. The Lounge/ dining room is located on the first floor and benefits from distant sea views. 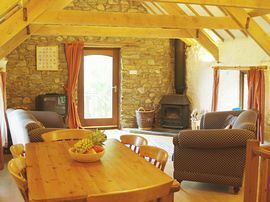 It has exposed beamed ceiling, log burning stove, a small balcony leading to the external staircase, and is furnished with comfortable sofas, easy chairs, pine dining table and chairs, colour television, CD player and items of occasional furniture. Kitchen is also on this floor, is fully fitted with electric cooker, automatic washer/drier, dishwasher, fridge/freezer and microwave oven. The Shower Room contains shower cubicle, wash hand basin and WC. Downstairs there is a further Bathroom containing bath, wash hand basin and WC. The Master Bedroom contains a pine king size bed, the Second Bedroom with twin beds, Bedroom Three with bunk beds. 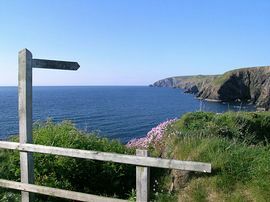 Within minutes of Pembrokeshire National Park. There are ample grounds around the property where children can play, also a large patio with garden furniture and barbecue. Ample parking.